Robert L. Ward, Sr. was born in Bridgeport, Pennsylvania. His storybook life is a tale of a remarkable man, hero, mentor and father. During World War II he was a radio operator on B-24s for the Army Air corps in the China-Burma-India field of operations. He won the Distinguished Flying Cross and 3 air medals. Following the war he was a police officer for 22 years and a Pennsylvania corrections officer for 27 years. He was also a member and Past President of the New Hanover Twp fire department. Married to Marie M. Kelso the couple had a daughter Cynthia (Witman) and a son Robert L. Ward, Jr. (ALPCA #144). Ward, Sr. passed away May 23, 2008 at Pottstown, Pennsylvania. Robert was a Charter Member of ALPCA. He started collecting in 1951 and hosted a meeting with Asa Colby in 1953 to outline plans for the creation of the club. He served as club Secretary-Treasurer from 1961-1966. He was also a National and Regional meet host and the first Membership Drive Coordinator. One of his first moves as Secretary was known as "The Party's over". This effort designed to attract new members and stop the free lunch handout of the newsletter. He formatted the newsletter to a clear typed copy with pages printed on an old hand cranked ink type mimeograph machine. He expanded it to sixteen pages and distributed it monthly to paid up members. Hall of Fame member Jim Crilly credits Robert with signing him up as a member and called him a great organizer and contributor to the club and the hobby. Hall of Fame member Rich Dragon called Robert a great source of inspiration and an invaluable mentor when planning the 2004 National. Beyond his role with ALPCA, Robert was an active member in the following organizations. 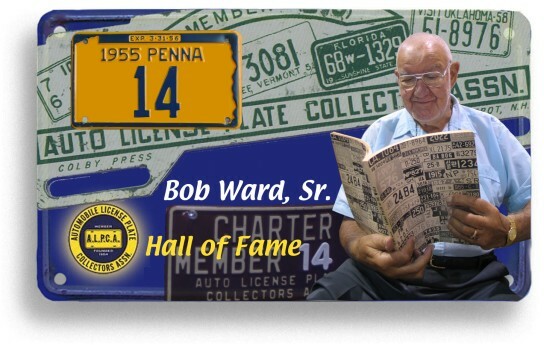 With utmost respect and pride we welcome Robert L. Ward, Sr. to the Hall of Fame.